This page has some info on my boat currently in progress. Reverse chronological order. Well, I see that this page has gotten a bit out of date! I'll have to do a proper update sometime, but for now here's some of the latest developments. I added this spacer to make the main hull asymmetric! In general, the boat is set up very traditionally. 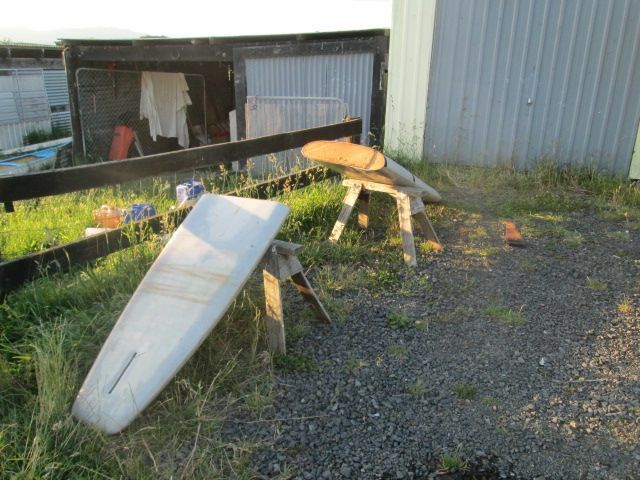 No fancy rudders, boards, or anything not found in the Pacific a few hundred years ago. 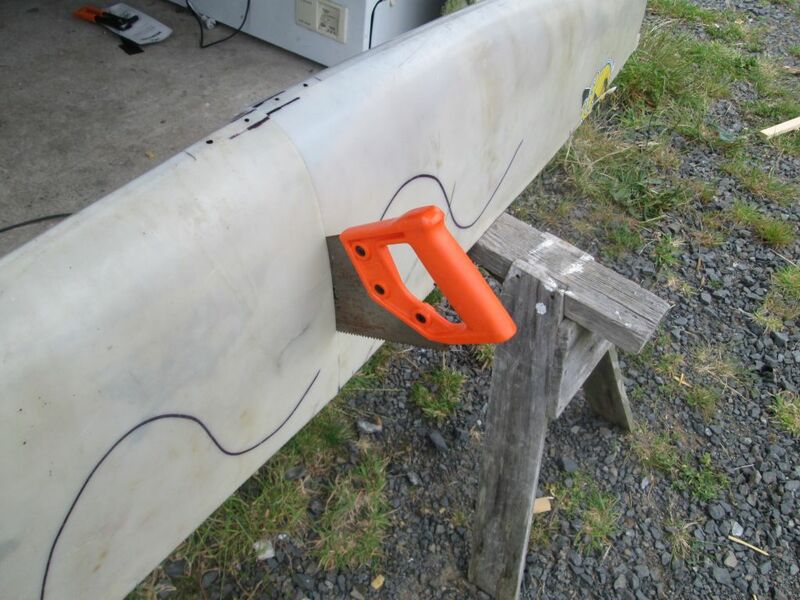 The steering oar has a line wrapped around it, ending in the cleat. Effective and pretty quick to swap sides. In practice the oar was usually just trailing in the water, not needed to steer the boat on any point of sail. We found the forked sticks on the beach. 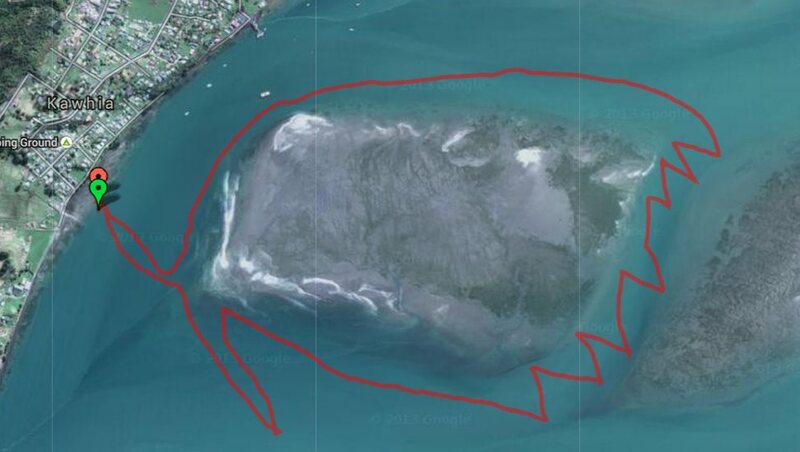 Below are some gps tracks of the four days of sailing. Wind was generally pretty light. Upwind travel didn't feel very efficient, but the tracks show pretty consistent upwind progress. As long as I kept out of the tide! The only thing preventing leeway is the hull shape. Although a leeboard is shown at times, this wasn't balancing right with this sail, and caused the boat to bear away. The striped regions on the map are tidal, sand banks at low tide. I was at times sailing in knee deep water, including upwind! Another great afternoon sail, this time with a bit more wind! Although while rigging it seemed almost windless, I could read the secret signs of wind that Ngaroto shows with a westerly. Soon after launch I was blasting along at up to 10 knots! It took a little while to get some good control going. The boat would suddenly bear away rapidly on port tack, one time almost resulting in a “gybe” (not good). It turns out the leeboard has twisted in the sun. This also meant on starboard tack it was impossible to get going properly, as the boat kept rounding up. I shot some nice video of a long close reach when I got the hang of steering, and then on the way back some more of sailing with the sail brailed. Then knot tying the shunting line to the yard came loose, which I managed to fix just before crashing into a maimai (duck hunting cabin). An epic motion picture has been created to remember the events of the day. Everything was still sitting on the roofracks so went for a little sail today on Ngaroto. No changes to the boat since last time. Winds were very light, maybe 2 to 5 knots or something. Enough to keep moving and keep the sail filled the whole time, and perfect conditions to improve technique. Unlike the last time, the boat was perfectly controllable by adjusting the centreboard, weight shifting and playing with the mainsheet. Paddle still needed for dead downwind though. Shunted more than 10 times both up and downwind, with no problems. It's a bit like tacking a windsurfer, with the boat pivoting around the leeboard as the sail is moved across. I've been watching some videos to see how the experts (polynesians) do it, and it works very well! 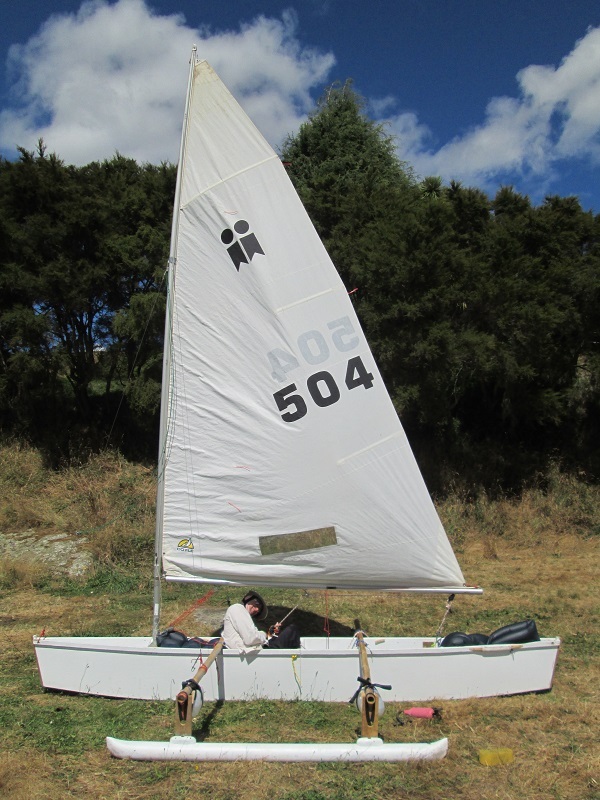 Sailing with the tacking rig at Kawhia was a lot less smooth, with vigorous paddling required for every tack. 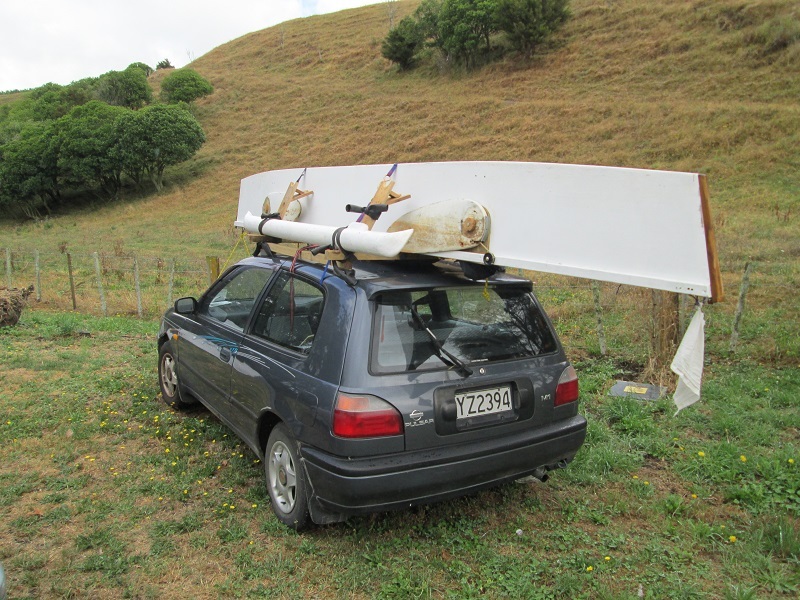 Took the outrigger canoe to Kawhia for a little holiday. On 28 Dec tested out the new ama and lateen rig. Very nice! I tried using the “lee-rudders” again, but still found them very annoying to use. Not a lot of wind, but video to come! 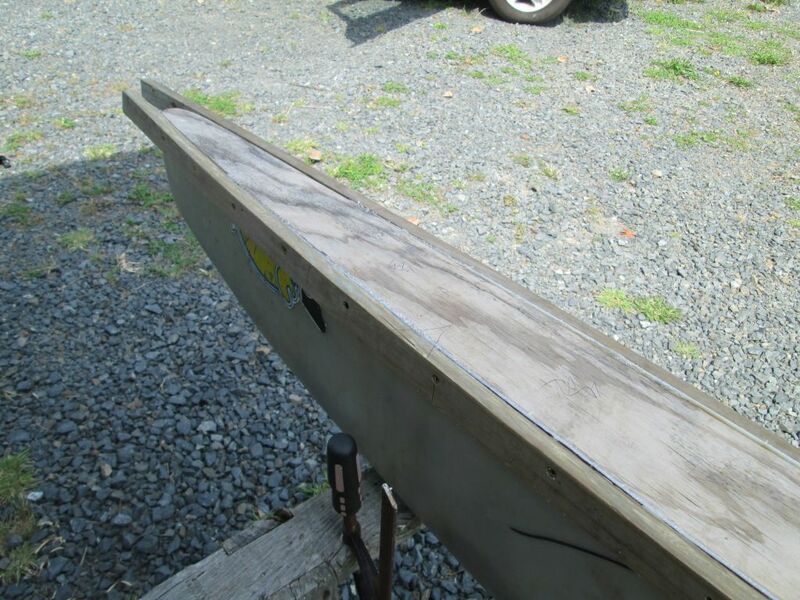 I then reconfigured the boat to have a single leeboard for use with the tacking rig (white and blue lateen sail). Sailed it at the same time as a regatta, so I kind of sailed along around the sandbank. Speed downwind was similar to the Hartley 14's. Reaching slightly faster. Upwind at times I was going the same speed, but tacking with the paddle was very difficult, so at times I stopped or slowed down to let people pass so as not to be annoying. The wind was probably 10 to 15 knots, and the cross beams (severely cracked bamboo) were making some suspicious sounds! The main problem was hiking out hard while still paddle steering. This made it virtually impossible to sail a close reach. On one broad reach I hit a top speed of 18.3 km/h (9.9 knots) with the ama flying. Not bad for a 4.5 m2 sail. The total distance was 8.3 km. The other problem was the mainsheet, which was rigged a bit stupidly. This meant there was a lot of force on it. All in all it was a great sail. At times I had the ama fully submerged, or fully flying on the other tack. On a few points of sail I was also able to steer without the paddle, allowing me to hike and get some good speeds. I then made another leeboard mount at midship for use with the new oceanic lateen. I also sorted out the rigging, replacing some of the odds and ends of line with the best I had lying around. The total rigging consists of a mainsheet, a windward stay (adjustable) and a brailing line. There is also a loop which acts as a kind of mast partner preventing it falling over. When I went to try this new sail it was again blowing 10 to 15 knots. As soon as I got the rig up it blew over, leaving me looking a bit stupid! I then reset the mast, this time with the boat pointing more into the wind. I bravely set off, using the paddle and leeboard to steer. Unfortunately the centre of pressure of the sail was just too far back, meaning the paddle had to be used pretty much all the time. I went off upwind for 200 metres or so, along the beach. I then brailed the sail and shunted, and tried to head back downwind on a reach. Unfortunately this was impossible! I had to be fully hiked out to keep the boat upright, and still steer. Not possible. Luckily I could “reef” the sail using the brailing line, and head downwind at a more leisurely pace. Glad I fitted that line! The main problem with the oceanic lateen sail is it has too much shape at the head/leech of the sail, which used to be the bottom of course. This could be improved with a big cut out of the leech, but this would reduce the sail are quite a lot. Overall the shape is very good, and it is noticeably more powerful upwind than the blue/white sail, which is very flat. The shape of the leech (almost hooked, you could say) also means the sail misbehaves when it's flogging, smashing the boom around a lot. This means it has to be brailed in stronger wind when shunting. Between Christmas and newyears 2014 I also replaced the inflatable mattress floatation with some built in buoyancy tanks at the bow and stern. Yet to be tested! The new ama has replaced the old pvc pipe one which was just not heavy or floaty enough. It worked, but it made everything unnecessarily difficult. The new ama was made by “reconfiguring” and old windsurfer. 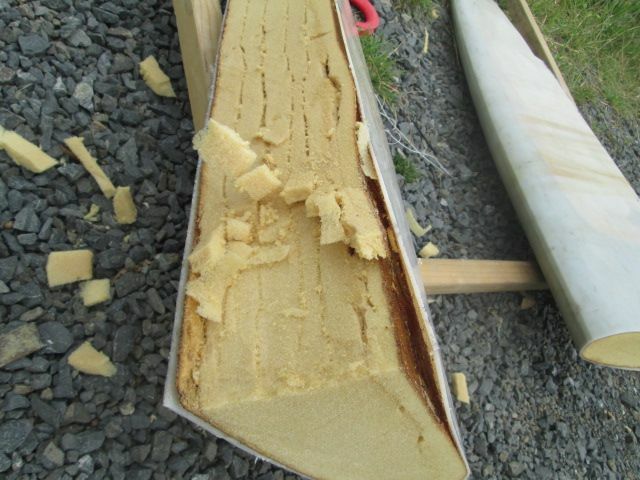 The construction was some kind of thermoplastic over foam (probably polyurethane). 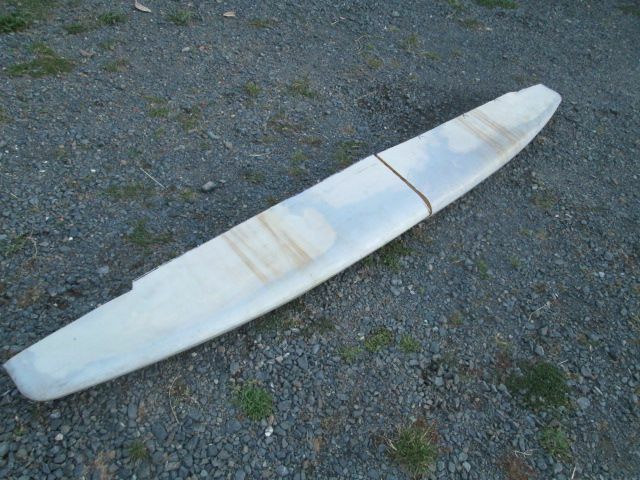 I cut the stern of the board off, cut that in half again and joined the two pieces end to end. 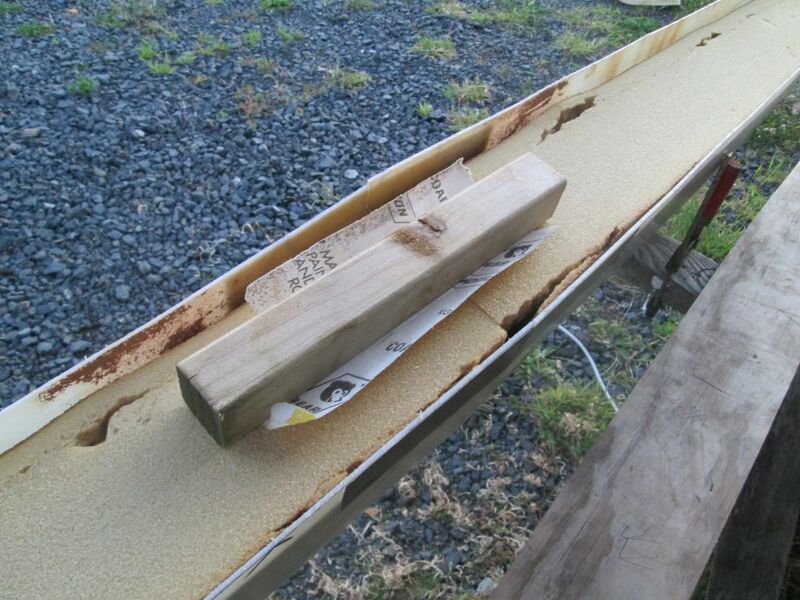 A deck was cut from 20 mm plywood. I carved the foam out from the top of the ama to allow the deck to sit on the foam, inside the plastic skin. 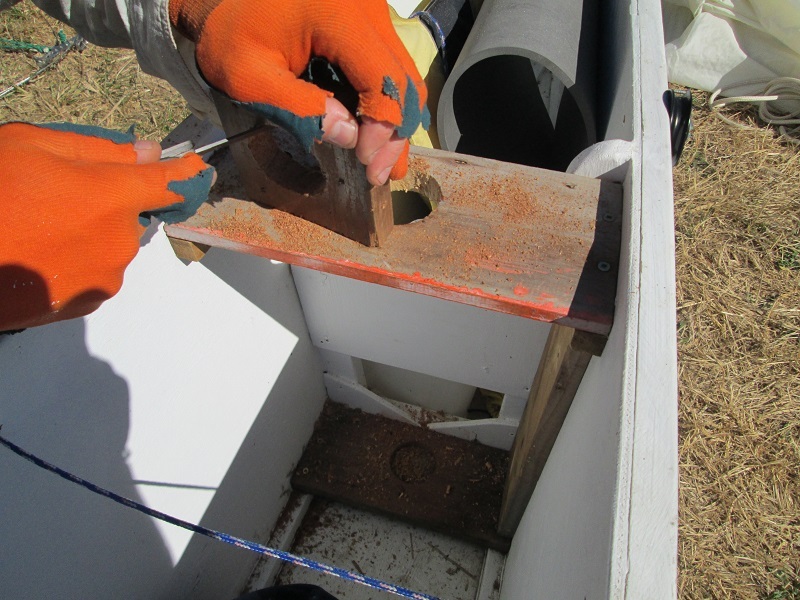 A recess was carved into the foam in both halves allowing a wooden joining piece to be inserted at the keel. 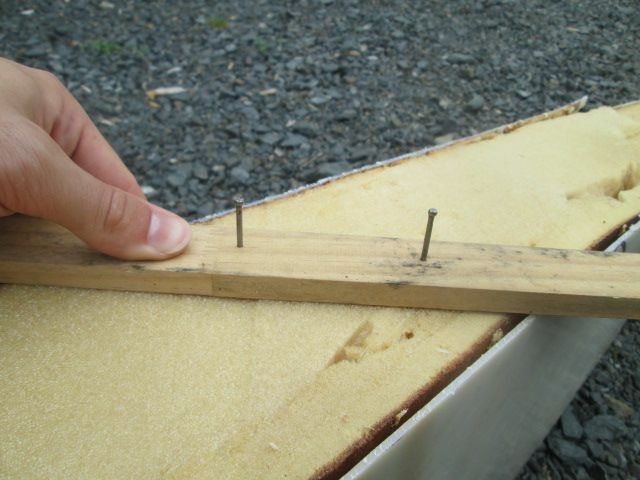 A couple of gunwales were put on, these clamp the skin to the deck, with a bunch of screws and silicon sealant (real high class stuff). Finally some supports for the ama were put on. The plastic of the two halves was then sealed together using a soldering iron. Well, old sail realy. After some work on the sewing machine my “oceanic lateen” sail (Old Micron sail) has been improved with some additional reinforcements, and some of the leech cut off. It's still not perfect, but it does have a pretty good shape when in use. 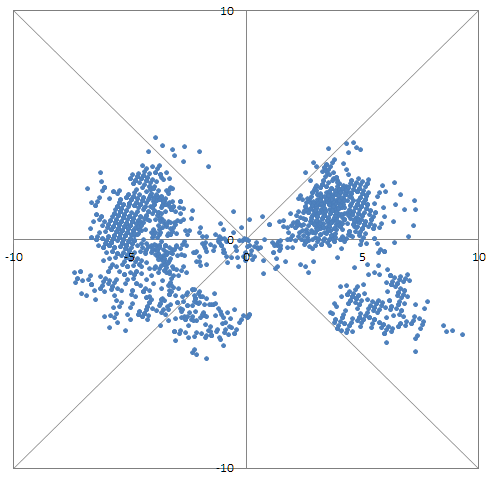 I've spent a couple of hours trying to make a polar diagram from my gps data. The program I used to record my track only puts out latitude, longitude and time for a whole bunch of points, but using some Excel magic I was able to convert this to useful information. Once I ironed out all the bugs it seemed to spit out this sort of plausible picture. If anyone is interested here is the quick and dirty spreadsheet I used. Thanks to Kevin O'Neill for inspiring me to give this a try. 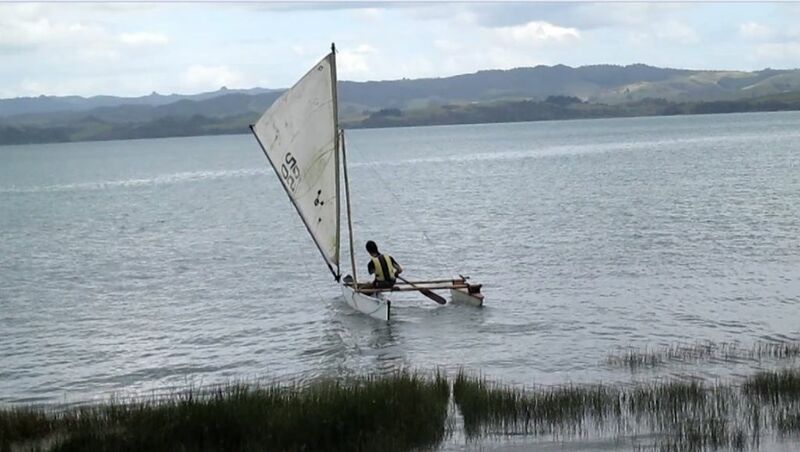 Lake Ngaroto, up to around 10 knots of wind guestimate. Maybe a little more in the biggest gusts. Was using the blue/white lateen again. Shunting went well with no problems at all. I feel like the boat could go a lot faster if leeway was reduced more. I managed to unload / load from the roofrack by myself, but managed to break one of the lashing buttons. Oops. 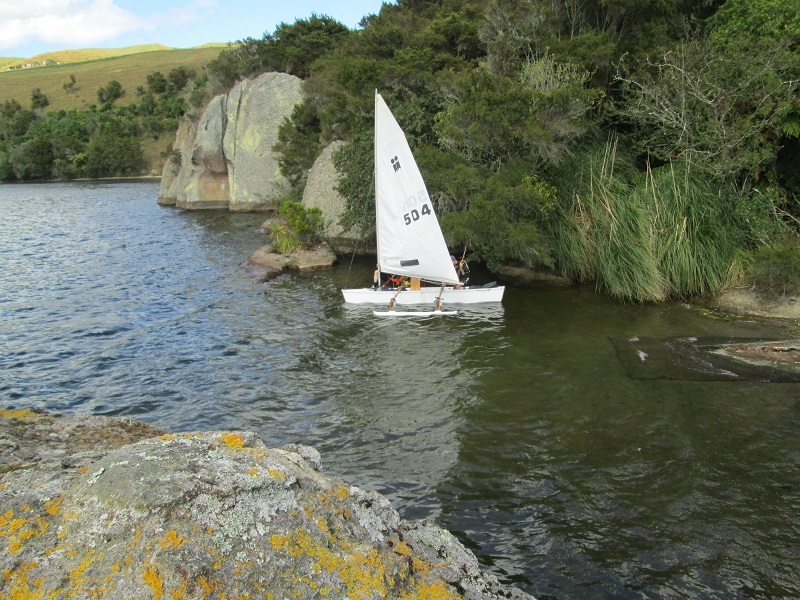 My sailing club has an away weekend to lake Arapuni every year, during a time where water quality and wind at our lake are usually dubious. 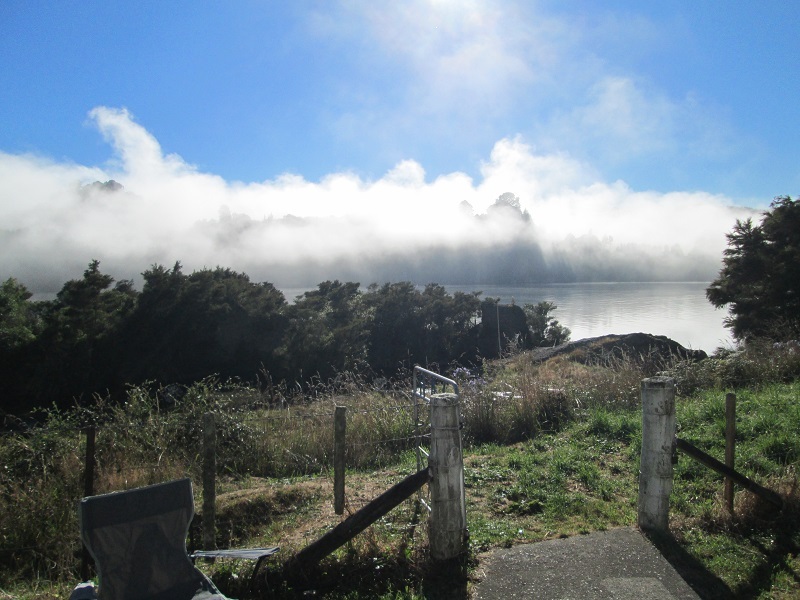 Lake Arapuni is a long hydro lake with high rock walls on both sides. It was raining when I left home, and I wasn't expecting much luck with the wind based on previous years. 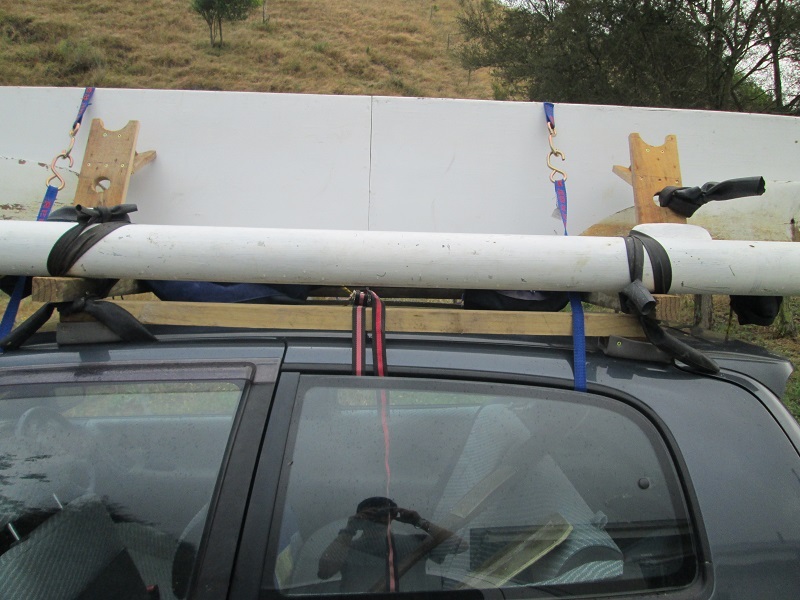 I therefore loaded the boat onto my new experimental roof rack, but left the mast and sail at home. 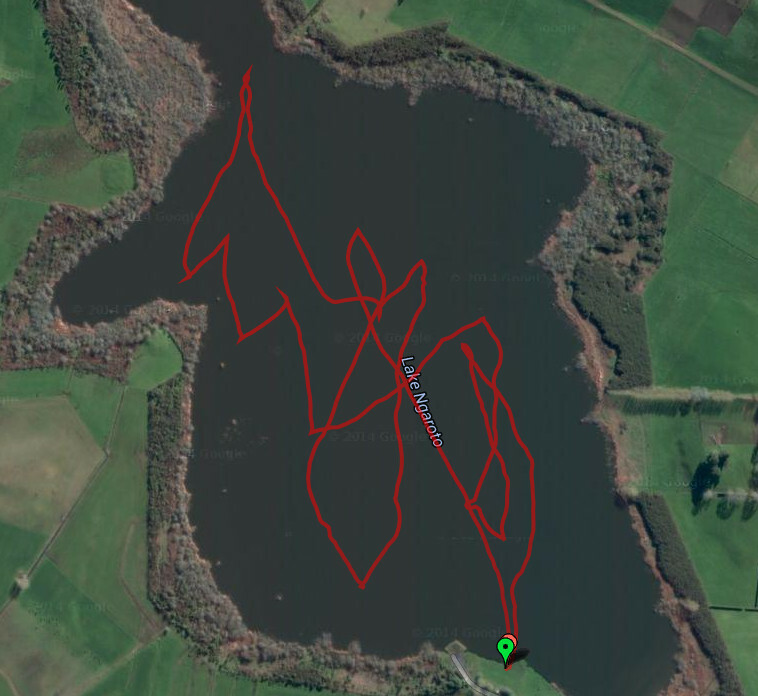 Of course when I got there, and it stopped raining, the wind was straight down the lake and perfect for sailing! Luckily there was an optimist rig which I could use on the boat. But how? 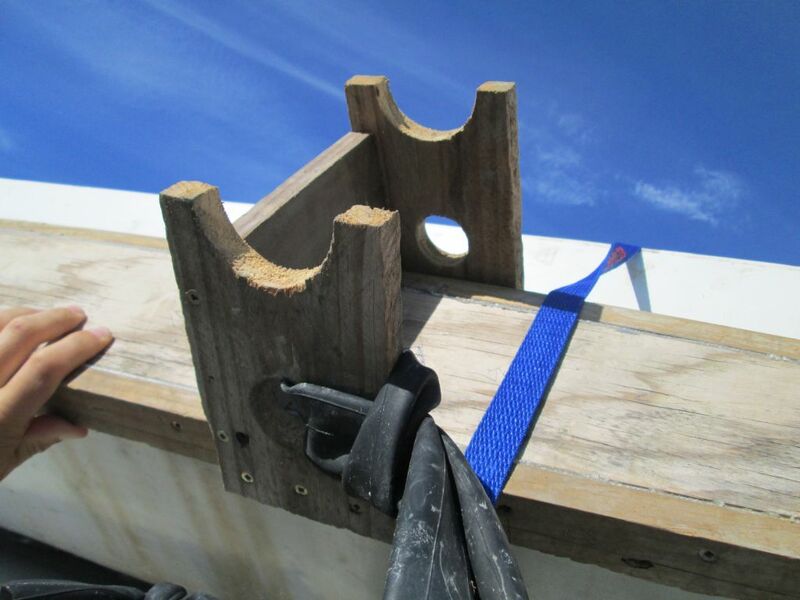 I could rig up some stays and step it on the gunwale, or step it into my existing mast step. This would have left the boom extremely low. I therefore decided to make a little stub mast. I went looking for some suitable stub mast material, and of course nature provided! To be specific, I found a discarded party tent with a steel folding frame. 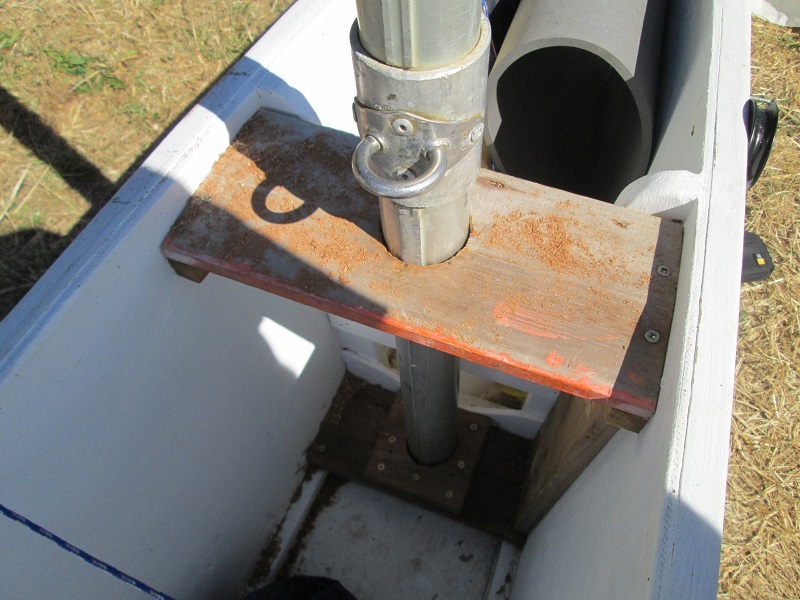 The corner posts fitted almost perfectly inside the opti mast! 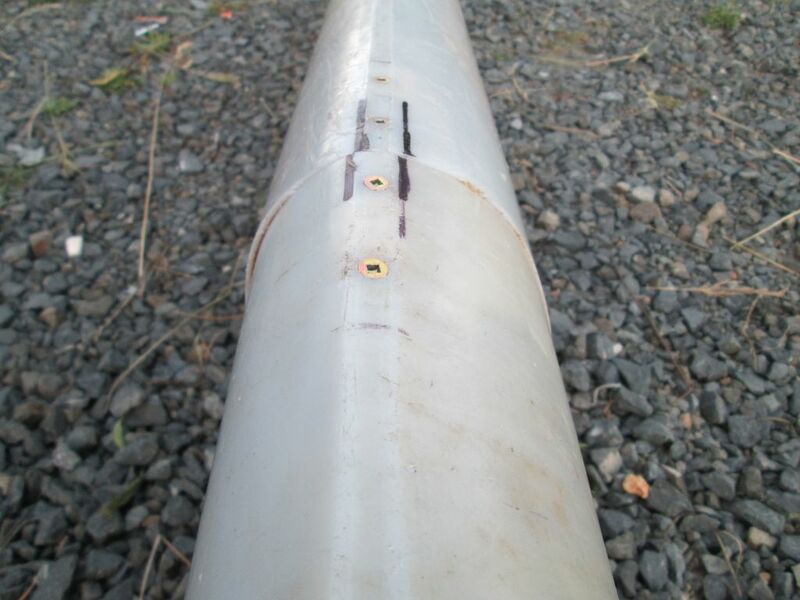 I added some spacers from inner tube, and a big collar of inner tube to prevent the mast sliding too far down the tube and wobbling around in the mast step. It worked perfectly! Had a nice sail in the afternoon breeze, and the sun had come out too! I could even tack the boat by shifting my weigh around without using the paddle. I then went for another sail with two people on board, which worked very well. Still sailing faster than a single adult in an optimist. The next day, it was time to up the stakes. 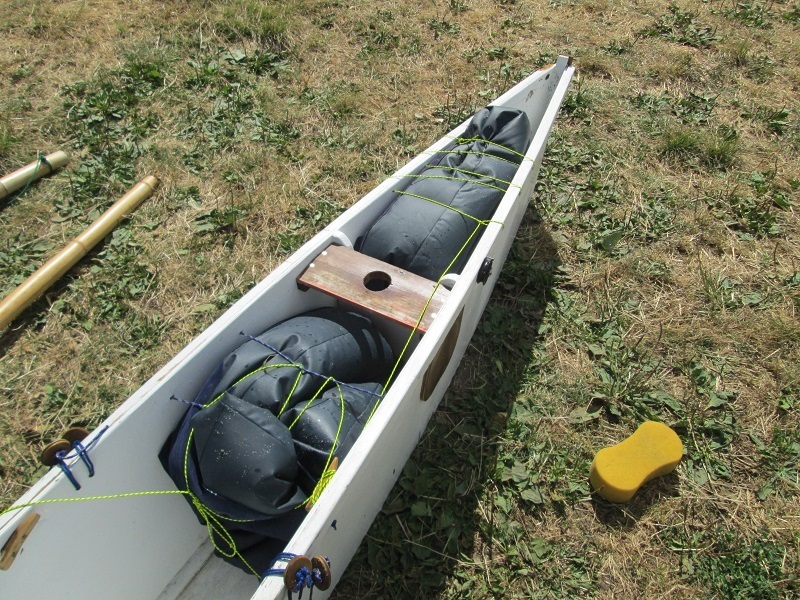 We had been joking about putting a Phase II rig on the outrigger canoe, and kind of talked each other into it. Well, the sun was shining and there was an onshore breeze. “What could possibly go wrong?”, we said, pretending we had no imagination. The Phase II has a combined sail area (jib/main) of 13 sq. m., so I guess the main is around 11. Not something to be sneezed at. Of course things weren't that easy. We first had to slightly enlarge the mast step and mast partner to fit the mast. Using a square file and pocket knife we got this done, although the result isn't the most beautiful carpentry job ever done. The burning sun didn't help make this a more enjoyable task either! We then shifted the outrigger closer to the main hull, so that about half a meter of beam projected on the other side. 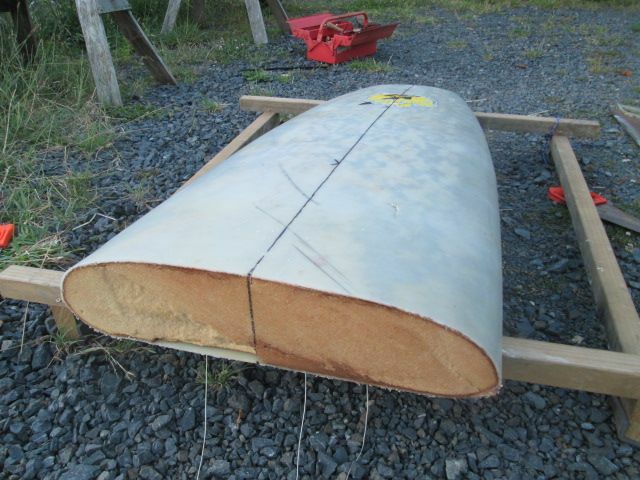 The side stays were tied to the front beam, and the fore stay to some holes in the front of the canoe. A pulley from the optimist was tied on to give a 3:1 purchase on the main sheet. And were were good to go! We bravely set off from shore, ignoring the little voices in our head. The wind was around 10 knots at this point, and a little gusty. We had to paddle a bit to get away from shore, and promptly almost capsized both ways multiple times. It was not very stable, to say the least! The boat had quite a lot of weather helm, and we had to sit right back to get some control and stop rounding up. Whenever a gust hit, the outrigger would promptly submerge, usually only up until the reserve flotation/buoyancy bottles hit the water. Which would slow us down dramatically. Not long after leaving the shore we had our first near capsize (well, we were constantly on the point of capsize really), when the boat almost tipped over 45 degrees. It didn't actually feel like that far, and the monkey like antics of the crew saved the day somehow. But the video footage does not lie. We were laughing hysterically half the time because that's what you do in the face of danger, especially if self inflicted! Our next problem was that we had run out of lake! 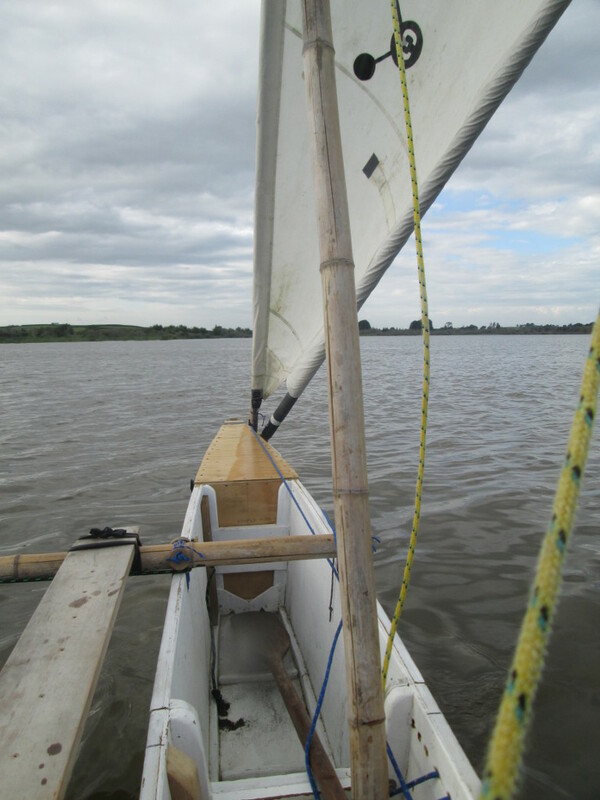 We managed to tack using the paddle, and set off on the new tack, with the outrigger to windward. What a difference! Of course the boat now had even more weather helm, but once I got the paddle wedged in the right place the boat really took off. Every gust would see us almost capsize, then the sheet would be released, and we'd almost capsize to windward! The bursts of speed in between were fantastic. We were both leaning precariously onto the rear outrigger beam, and the mast was stayed to the front beam, so there was a lot of twisting and creaking sounds. But nothing broke, miraculously. 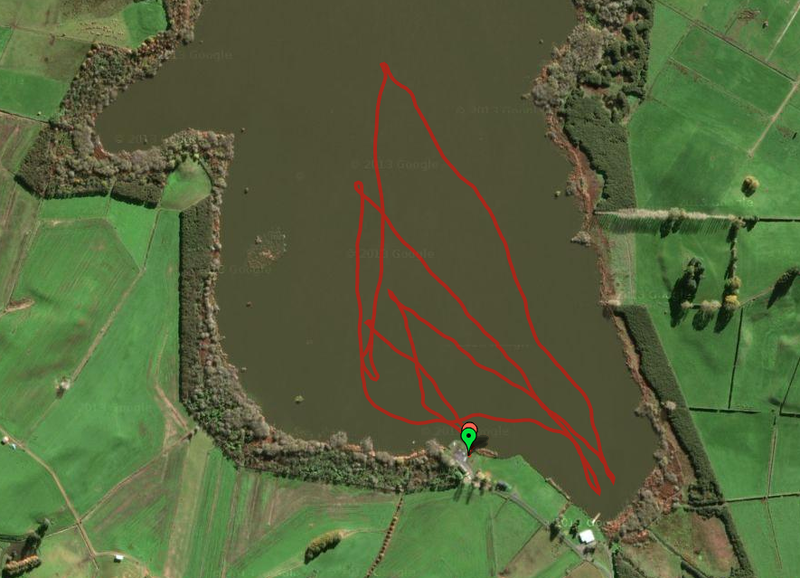 We quickly ran out of lake again, and I foolishly decided to gybe around. We gybed, and capsized. It seems the main sheet got caught on something and that was that. Our spare paddle floated away, never to be seen again, but I held onto the steering paddle for dear life. The boat was floating nice and high with the buoyancy bags working well. The mast was lying flat on the water with no tendency to submerge. I kept the boat head to wind, and the crew climbed on the hull by the front outrigger beam (where the mast was stayed), leaned on the beam and the boat came up easily. The crew then tried to climb in as the boat came upright. Unfortunately the added weight of the crew and giant aluminium mast caused the bow to submerge, and the front buoyancy bag popped out from underneath its ropes. The boat was now upright, but floating with the bow half a meter below water! We tried to stuff the bag back in place, but that was simply impossible. We got it jambed under the beam, and by leaning on the stern of the boat we got the bow back up. Bailing was impossible, so we “sailed” the boat back while still submerged. We were both hanging of various bits of the boat. Holding the sail to increase our drift rate to shore. We were going backwards forwards. Cartwheeling the boat. It was pretty funny. When we were almost there I was starting to get a little cold, but the sun soon fixed that little problem. We bailed out the boat and had some lunch! Our hilarious antics were all filmed. Unfortunately, I had not emptied my memory card before leaving on this trip, and none of the capsizing was saved. Oh well. After lunch we re-distributed and tied in the buoyancy, and attached some paddles and sticks in strategic locations to try to hike out on. We did a capsize test before we set off again, and were happy enough with the result. Around 2 minutes of bailing would see us on our way again. This time we were really flying! We got the hand of controlling the beast and only capsized three more times, each time when the mainsheet would jamb for some reason. We still didn't have a hiking bench or anything, but basically leaned out of the hull like it was a dinghy, holding on to the beam or stick like object lashed to it. The second capsize I heard a big crunching sound. I thought the bamboo beam had finally snapped, but actually it was a wooden paddle which the crew fell onto. Big relief. We were sailing quite a bit faster than an RS Feva which was also out sailing. A lot of fun, but not recommended unless it's nice and sunny, with clean water! A nice evening sail trying out some new features. These include new ama connections, buoyancy bags, boards, and a newly arranged rig with shunting line. 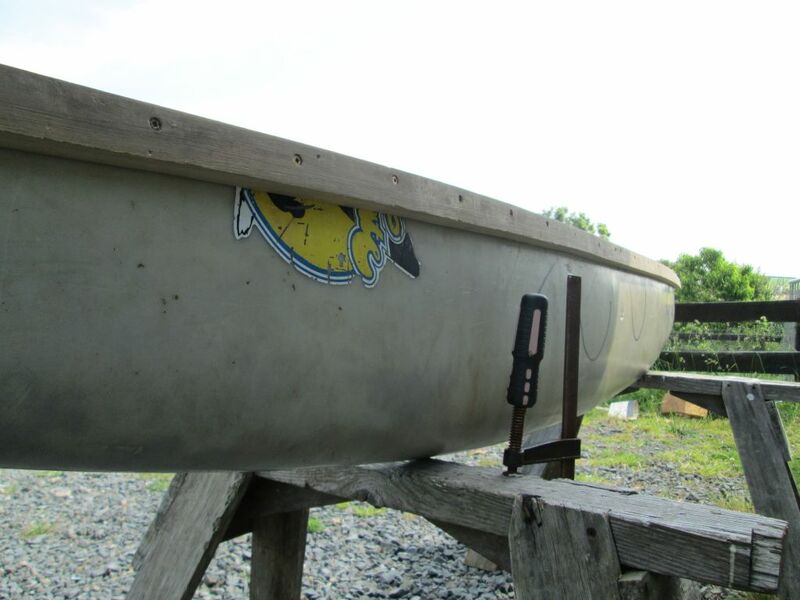 The boards are set at a slight angle, so lowering the rear board makes the boat bear away. Many thanks to Gary Dierking who gave me the two rudders which I used for this. I didn't want to modify/destroy the rudders to work with a shunting setup so I just used the blades as is. The buoyancy bags are actually inflatable mattresses for camping. 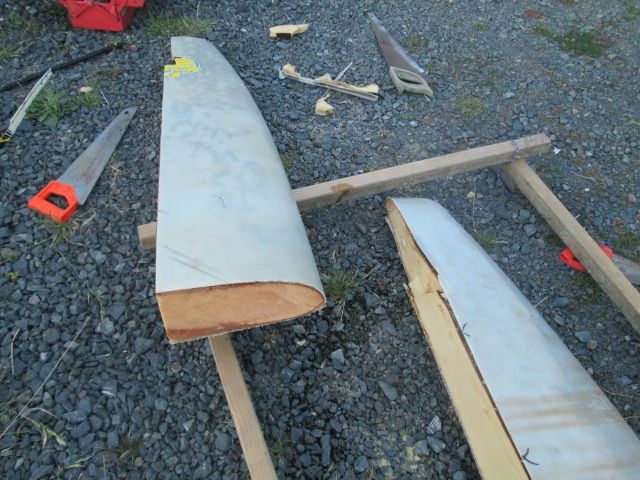 They both have slow leaks, so they were donated to the outrigger canoe project. 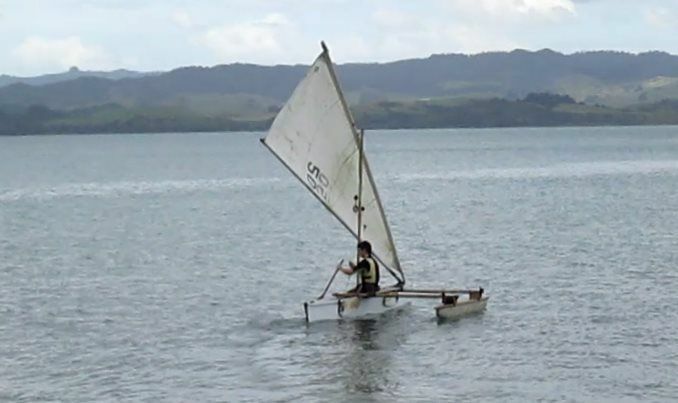 The capsize test was very successful, much better than the previous arrangement with plastic jugs. Everything worked, basically. 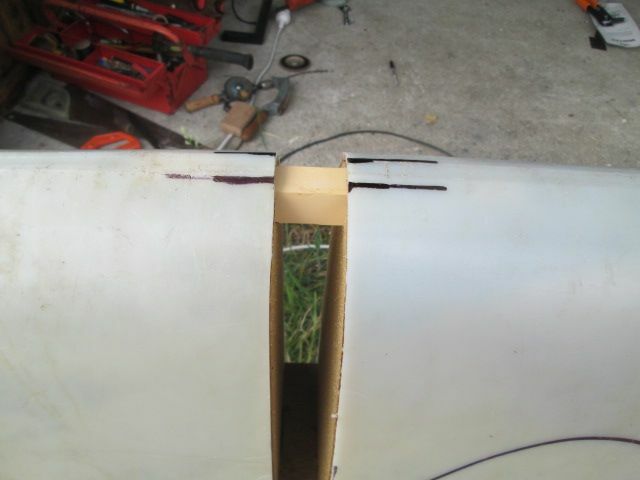 The only small problem was that the rudders, which have a “pull up/forward line” need something to pull them back as well. I was hoping the water pressure would do this, but that was not the case. After a long winter hibernation followed by finishing off Uni, finally got a sail in! I've been playing with the canoe on the lawn over the last few weeks trying to figure out the shunting rig. Not there yet I'm afraid. So far keeping it extremely simple is looking the most promising. Used a tacking rig today, the sail is a lateen rig off another of my boats. The mast is an old laser top section. Unfortunately the winds were very light and quite changeable. Glad my mast was fixed! Paddle sailed around anyway for a few hours enjoying the odd puff. When the boat got pulled out at 5pm, suddenly the wind kicked in! This is pretty common on the lake I sail on, although usually it arrives earlier. Anyway, put the boat back in and went for a short proper sail. Wow, really fun! The boat moved very well, going at times the same speed as the laser that was also out sailing (novice). Certainly didn't go upwind well with no leeboard, but good enough to make it back to the boat ramp. The boat can be sailed upwind and reaching without a paddle only with the ama to leeward. With the ama to windward the boat gently heads up unless I sit ridiculously far back. Sticking the paddle in the water fixed this. I even got the ama flying for about six seconds a couple of times, the main difficulty in keeping it up for longer was steering, the centre of lateral resistance seems to move forward as the boat speeds up. Also got the ama to submerge a couple of time, with very little noticeable increase in drag (it's pretty small). What really made a difference today was the addition of water ballast to the ama. This sounds high tech but was actually just a couple of old 5 litre sauce containers hanging off the ama forked branches. They were both around 60% full, so about 6 kg of weight added, at a lever arm of about 1.5 m. I arrived at this amount by playing around with it in the pool. With both containers full the ama pretty much sinks. Both half full is enough to balance my weight on the opposite gunwale and leaning out a bit. This gives great confidence when moving around in the boat. After todays sail around I think the weight can be reduced a little more. As an added bonus, once the ama sinks the half full containers provide extra flotation as well. I almost started building a new ama, then I remembered the quote “you can always add weight to a light ama” or something along those lines from Gary Dierking. Certainly quite a bit of stuff to improve on, not the least a more comfortable place to sit. Using these, I was able to do the four lashings in less than 8 minutes. That means I've reduced setup time by probably at least 10 minutes! 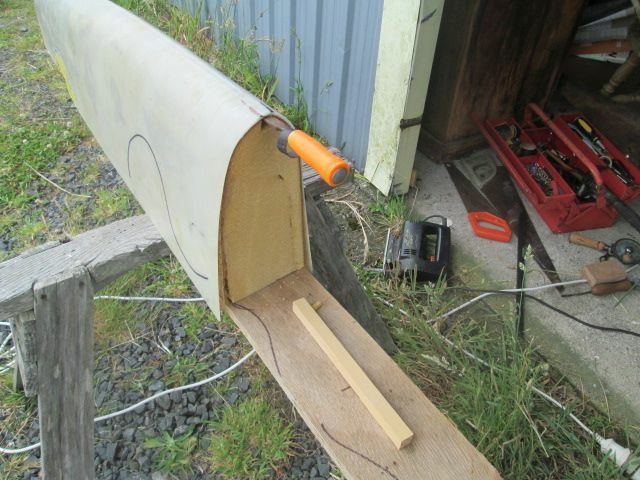 I've been busy making a mast step in the boat, for a free standing mast to use with a tacking rig. I have a lateen sail and tiny homemade windsurfing sail to try out. Went for a sail today using the windsurfing sail. Again came late (had a sailing club event today) so not too much time spent sailing. The wind had been around 15 to 20 knots and very gusty (sailing club report here) so seemed like a good time to try out the small sail. Unfortunately the wind had dropped to more like 5 knots by the time I was ready. 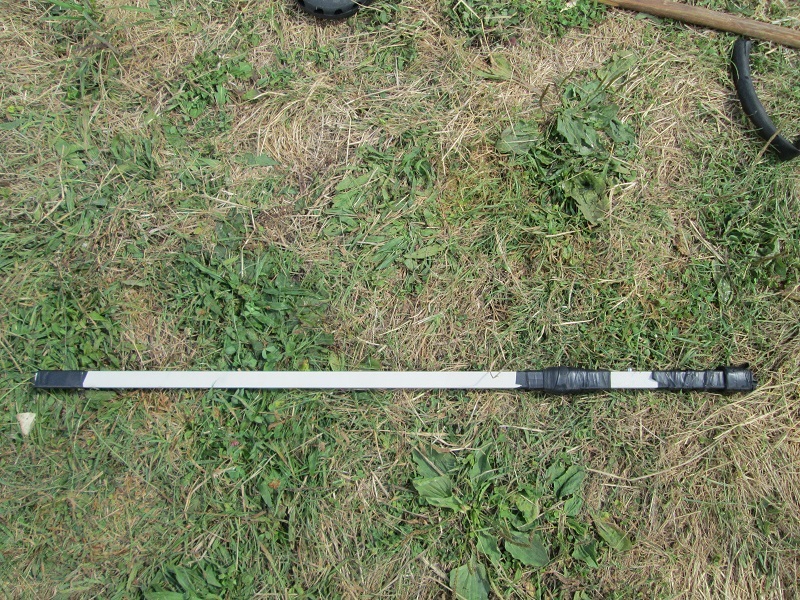 Or maybe that should be fortunately because my stub mast was a piece of cracked bamboo that was flexing alarmingly. Anyway, had a brief sail which went pretty well. Weight shift steering showed promise but had a bit too much weather helm so I'll probably move the mast step in front of the bulkhead. A couple of weekends ago (21 Apr) I took the boat for its first sail with the oceanic lateen rig. Unfortunately I got to the lake a bit too late, the wind was already dying, and not too much time left until sunset. Setup time and take down time are both about 30 minutes, including all the lashings and tying to the roof of car. And some sore fingers! The lashing holes need to be made bigger to get more wraps of rope through easily. I did sail around a little. Shunted maybe three or four times with no nasty incidents. That was using the lateen sail, mast with just one sidestay and no shunting line (so carrying the rig by hand). It was clear that there was too much weather helm though, which is too bad as the centre of effort will have to go even higher now to balance things out. Oh yea, no photos because it was pouring down with rain. I've been considering how to sail this thing the last week or so. I have a sort of crab claw sail made up, from an old micron sail. The proportions don't really work out, the sail needs to be really high to get the centre of effort in the right place I think. And then there's also the shunting problem. I'm keen to try keeping the rigging to a minimum, so just going up to the bow, grabbing the sail and walking to the other side. But I'm screwing it up even on the lawn, so on the water will be a little difficult I think. Going to try adding some backstays first, then see how we go. I have moved this to a new page to improve page loading times.